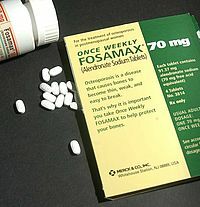 Mercke Sharp & Dohme Corp. developed a drug called Alendronate for treating osteoporosis which is marketed as Fosamax®. Fosamax has annual worldwide sales of over one billion US dollars. The drug has a number of unpleasant side effects. Merk filed a patent application for reducing the side effects via a different dosage regime. Specifically, Merck’s patent proposes a higher dosage taken less frequently. The patent in question is WO/1999/004773 titled “Method for Inhibiting Bone Resorption” and covers a once weekly oral dosage pill for alendronate and other bisphosphonates for the treatment of Paget’s disease and osteoporosis. It was filed in Israel as a national stage entry of the PCT as IL 153109. The Israel Examiner allowed the patent, but when it published for opposition purposes, Unipharm opposed the patent claiming lack of novelty, obviousness and that it was essentially for a medical treatment and thus was directed to subject matter considered non-patentable under section 7 of the Israel Patent Law. An article summarizing the original decision by then Commissioner of Patents Dr Meir Noam may be found here. Essentially, Dr Noam (who is a chemist by training) threw out the non-patentable subject matter objection and ruled that that clause was to protect doctors and pharmacists in prescribing and drugs, but the subject matter was patentable. However, he ruled that in light of the prior art, the claimed invention lacked inventive step as it was “obvious to try”. The district court upheld this decision and also the separate decision to award record costs of NIS 550,000 (which is about $150,000). Merck appealed both the ruling of non-validity and the costs awarded to the Israel Supreme Court. In a 12 page ruling, Judge N Handel rejected the second appeal, ruling that a further appeal is only justified in cases where there is an important legal principle or particular public interest. He noted that Dr Noam had held 12 days of hearings and had related to all the evidence in a reasoned decision so there was no reason to overturn it. He further noted that the separate decision for costs was based on a reasoned calculation and included NIS 150,000 in expenses and NIS 400,000 in legal fees, whereas the opposers has actually claimed NIS 1,402,854 in legal fees. He rejected charges that were costs were punitive and, in the circumstances, he didn’t consider the costs awarded were unreasonable. He awarded a further NIS 35000 to the defendants for having to fight this additional appeal. ‹ Getting frustrated with Patent Examiners?